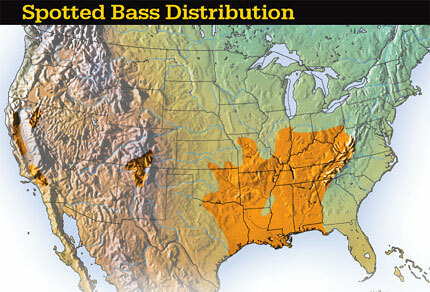 The Spotted Bass is another of the 3 main members of the group known as black bass. The spotted bass is often over looked by fishermen in pursuit of Largemouth Bass and Smallmouth Bass but in some parts of the country they are more popular then both of them. These great fish have many of the same characteristics as the smallmouth and largemouth and they were in fact looked at as a hybrid or a strange type of smallmouth until the late 1930’s. The spot, as they are affectionately known, were originally concentrated in the south and eastern areas of the US but their range extends north into Iowa. Spots are present throughout the Ohio River basin as well as the central and lower Mississippi River basin they may also be found from Texas east to Florida. Although these bass are native to portions of East Texas from the Guadalupe River to the Red River they remain unfound in the Edwards Plateau region. Spots grow strong but not as large as the Largemouth Bass. In fact they grow to only about 1/3 of the size of the largemouth. They have been known to grow to a maximum of roughly 5.5 pounds. The Spot has a light greenish color and a darker back. They have a dark lateral band that is made up of mostly irregular blotches. The scales below the lateral line each have a “spot” on them and thus their name the Spotted Bass. The jaw is shorter then a Largemouth Bass but longer then a Smallmouth Bass and runs almost to the rear of the eye. Spots seem to be segregating themselves from the smallies and largemouth bass. They tend to be found in areas with more current than largemouth, and they usually inhabit areas that are too warm, turbid, and sluggish for smallmouth. Rock and gravel are the preferred spawning areas and they have a much wider range of water temperature that they can spawn in (57-74°F). Nest depths vary widely as compared to their cousins. Females may lay between 1,150 and 47,000 eggs and like the smallmouth and largemouth the males guard the eggs during incubation and guard the fry for up to four weeks after they have hatched. As young fish grow their diet shifts from zooplankton to insects, and finally to fish and crayfish. The spots history is very similar to the other black bass in that they spawn in the spring and the male guards the nest. Like most game fish, they are carnivores and will feed on other fish and crayfish as they mature. Like their other 2 cousins, they tend to be located near deep water during summer and fall when shad are their primary forage. Spots are unique because they tend to be dominant over both the smallmouth and largemouth in some lakes. Dr. Mike Maceina of Auburn University has documented that “as West Point Lake in Alabama/Georgia became clearer due to nutrient reductions from the city of Atlanta, spots began making up a higher percentage of tournament catches than largemouth bass“. According to studies, during the 1980’s the spotted bass made up only about 20% of the bass in the lake versus about 80% largemouth, but by the year 2000, the spots had taken over and now have the majority at about 80% of the bass from samples in the same lake. These results demonstrated how aggressive spots can be if nutrient levels decline and water clarity improved. The Spotted Bass has also been known as the Kentucky Spotted Bass, The Spotted Black Bass, Spots and more recently, the Alabama Spotted Bass. With the aggressiveness and strength of this smaller member of the black bass group, they have become a more and more popular game fish. Always keep in mind that as with any fish, the spots should never be transplanted from one lake or stream to another because they can and will take over the population of other bass in that lake or stream. These fish should be enjoyed where they are found. I have never had the experience to catch one of these great fish but, you can rest assured that it is on my “bucket list”.